#ChangeTheClap is one of the few campaigns that directly challenges the way people perceive transgender people in Pakistan. This campaign by Asia Pacific Transgender Network (APTN) depicts the irony prevalent in Pakistani society. The same society that raises its voice for human rights, applauds each other’s achievements and acknowledges success, fails to recognise the plight of transgender people living amongst them. Instead, the transgender people are mocked, abused and harassed by the general public. They continue to live in a state of despair because of the state’s neglect and people’s apathy. The campaign picks up a common sight associated with transgender people, the clap. The transgender clap is a distinct horizontal flat palms striking against and perpendicular to each other, with fingers spread as opposed to the common applause-style, vertical palm & closed fingers strike. The transgender clap is a historical and powerful symbol for trans people but is widely taken out of context and mimicked by the public, to ridicule them. Changing the clap asks people to #ChangeTheClap from one of mockery to one of respect, appreciation and inclusion. It demands a change in mind-sets from the society, a change which welcomes the transgender community into the society and aims to provide equal opportunities for them. The campaign features a few prominent transgender people including trans activist and first Pakistani trans model Kami Sid who leaves everyone with a thought provoking statement. The campaign intends to raise awareness about the hardships faced by transgender people in Pakistan, help fight transphobia and advocate equal opportunities for them. APTN furthered the initiative with the simultaneous launch of a website which empowers people to help make a difference. Efforts as simple as uploading a video of them simply clapping in support of transgender people, on social media can significantly contribute to the cause. Each video posted accumulates to function as a currency of real change, in terms of employment opportunities, educational outreach and eventually the world’s largest clapping protest. Trans stories have also been featured on the website, unveiling their journeys and revealing the diversities of transgender people and how they made a name for themselves, in a world that only excluded them. 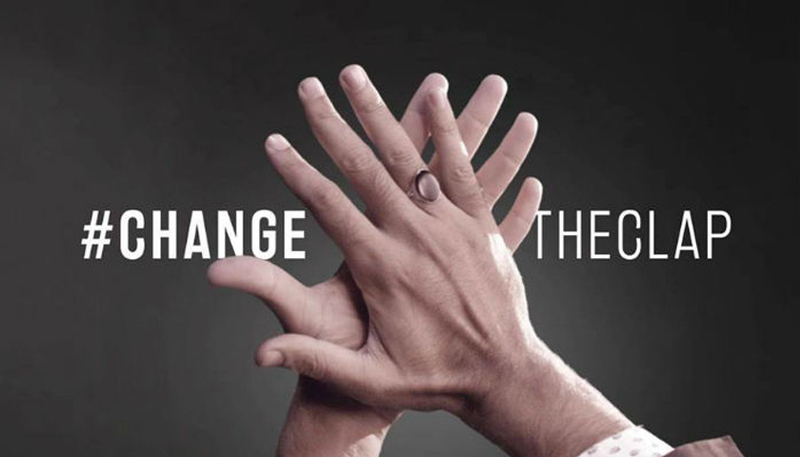 The campaign is a move in the right direction as it aims to accomplish equality and empowerment for transgender people living in Pakistani society, by calling out on people to take the first step, to simply #ChangeTheClap. Whose idea was it to start the #changetheclap campaign? BBDO Pakistan, came up with the idea of changing the society stigma around transgender community across the sub-continent. Asia Pacific Transgender Network (APTN) works closely with trans communities throughout Asia and the Pacific to respond to context and country-specific needs of the trans communities. We wanted to address greater society when speaking to the treatment of trans people and how everyone can take part in improving the lives of transgender people. Like with all of our other work, we wanted to create a specific and context-driven campaign and worked with BBDO’s amazing team to develop the campaign. What is the campaign trying to highlight? The campaign shows the harassment and violence that is faced daily by many trans people. This campaign calls for people to change their perception of trans people and to be part of the change that creates a more humane and equitable society. We also wanted to highlight the diversity of transgender people and the work and contributions that they are making to society. This is shown in the final scene where trans people are shown as teachers, students, activists, business people, and family members. What do you hope to achieve with the campaign? We are trying to get the transgender rights bill get passed in the national assembly as we believe that trans rights are human rights. Throughout the region, we are constantly working with transgender organisations and people that are so dedicated, passionate and working tirelessly to ensure the rights and protections of the trans community. Often, we see a disconnect with society and their perception of transgender people. We wanted to address these misperceptions and show the importance of including all society in the conversation to continue building a society that is loving and open to all people regardless of gender identity. It was also very important to APTN to highlight the diversity of trans people, to break boundaries, stereotypes and mainstream mentalities. We envisioned a campaign that will be representative of trans communities and have positive impact on the lives of trans people in Pakistan. Why is it important to have high profile people like Kami Sid and other celebrities support the campaign? People like Kami Sid are a great inspiration for the community and people of Pakistan. For a transgender woman, the kind of steps that she has taken for the rights of her community makes her very influential for everyone around the world. Kami Sid has been involved with trans activism and a friend of APTN’s for many years. She is a powerful force and has been so important in expanding people’s perceptions and understanding of the diversity and capacity of transgender people. It is truly beautiful to see Kami Sid utilising her power to improve and serve trans communities. We also want to recognise and thank trans people that are working everyday and do not have such visibility. They are critical and admirable members of society and the trans community whose commitment to human rights is truly awe-inspiring. We are extremely humbled and grateful to all of the people that have supported the campaign and have sent in videos #change the clap!